Rarely do you find the perfect home that checks off every item on your wish list. Unless you custom built your Havasu home from the ground up, you may have to compromise on some things. On the other hand, you want to make sure you don’t settle for something you’ll only regret later on. Investing in a home could be the most expensive decision you make. You want it to be the right one. 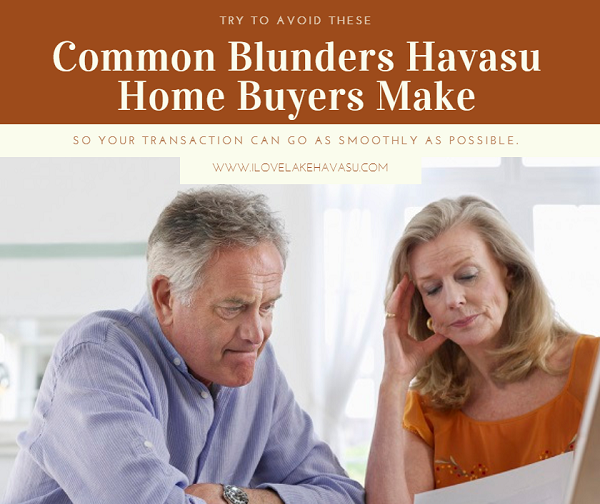 Avoid these common blunders Havasu home buyers make. That way, you won’t regret today’s decision tomorrow. One of the biggest mistakes Havasu home buyers make when looking at a property is to see it only in its current condition. Maybe shag carpeting should stay in the ’70s. Perhaps that bright fuschia “accent wall” leaves a sour taste in your mouth. And, sure, not everyone appreciates Prince Charles and Lady Di’s commemorative wedding plates. But all that can easily be changed. Many times, even walls can be demolished to change a floor plan to fit your needs. Instead of focusing on someone else’s design, look at the things that can’t be changed, such as the location. If it’s not exactly perfect but has good bones and sits in a great neighborhood, you may want to overlook the cosmetics. Another pitfall Havasu home buyers fall into is trying to do it all themselves. Even if you scour online listings religiously every night and visit any open house you can find, you may miss a good opportunity. Sometimes, a Lake Havasu REALTOR@ is privy to a listing that hasn’t hit the market just yet. It’s their job to know local real estate. They’re out there every day, talking to brokers and sellers, seeing what’s going on right now. Take advantage of their knowledge and relationships with other real estate professionals. Contact a Havasu REALTOR@ today to get them working on finding you your next home right away. Compromising for paint, wallpaper, and carpeting is one thing. Completely throwing out what you want is another thing altogether. Originally, you wanted a four bedroom home. You have one child and another on the way. Your parents are aging and may need to move in with you in the next few years. But, you see a property at an amazing price with less bedrooms than you want. If you decide to just “make do” with the three bedrooms, you’ll regret that decision when you need that extra room down the road. In fact, you may find yourself in the position of looking for a larger home in a short period of time. Determine the difference between what you want and what you actually need. Stick to the things you cannot live without but be willing to compromise on the less important stuff. You’ve already shelled out thousands of dollars for your downpayment, closing costs, title fees, etc. Why should you spend another couple of hundred on a home inspection? Because it could save you thousands of dollars in repairs. A home inspector may be able to point out potential problems that a simple walkthrough won’t uncover. Then, you can determine whether it’s worth proceeding with the sale or not. Be smart when buying a Havasu home. Avoid these common blunders that many buyers make. Then, your transaction is sure to run as smoothly as possible. Good luck and contact me when you’re ready to start looking.